One glance is all it takes to be instantly smitten with Fire Spinner Ice Plant. Vibrant, tri-colored blooms appear late spring and continue for weeks. Each blossom has a yellow center surrounded by a ring of white that fades into a light pink. The pink graduates into a fuchsia that then blends into a ring of red and finally bleeds into a bright, cheery orange. 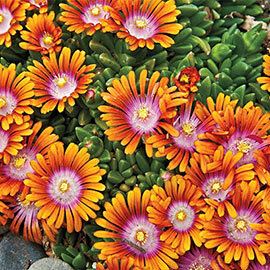 Fire Spinner is a perennial, evergreen groundcover that is heat-loving and easy to grow. 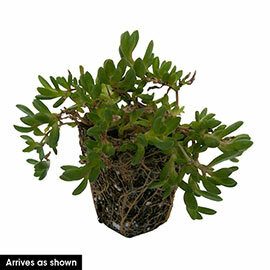 It does best in full sun and well-drained, sandy loam soil. Fire Spinner is lovely in rock gardens or planted en masse, and you'll love all the hummingbirds that come to visit. Zone 4 - 9 ( -30 degrees F.). Depth: Set at the same level it is at in the container, firm well and water in thoroughly. Color: Orange and purple bicolored flowers. Foliage: Needle-like foliage, grey-green leaves. Flower Form: 1-1/2" daisy-like flowers with narrow petals. Soil Requirements: A well drained soil that is sandy or gravelly is very important. Growth Rate: Moderate growth rate once established, which takes approximately 3 - 4 weeks.